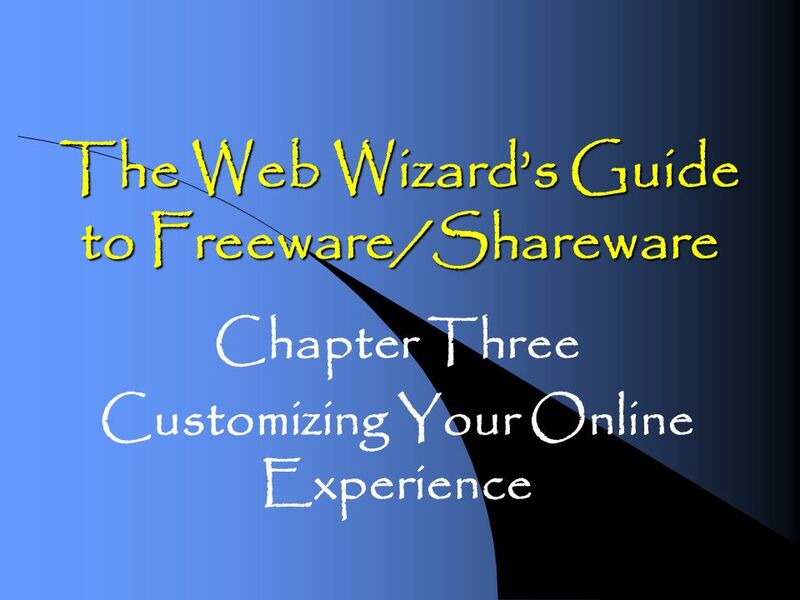 The Web Wizards Guide to Freeware/Shareware Chapter Three Customizing Your Online Experience. 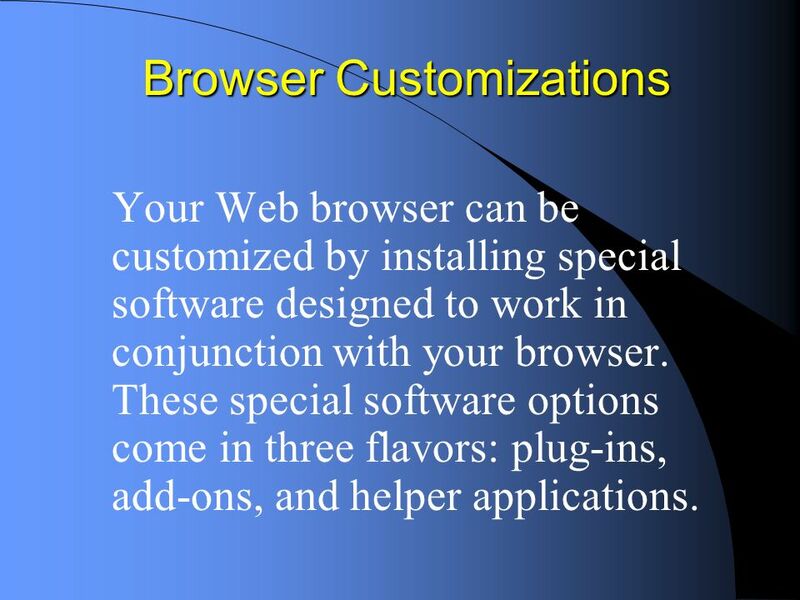 3 Browser Customizations Your Web browser can be customized by installing special software designed to work in conjunction with your browser. These special software options come in three flavors: plug-ins, add-ons, and helper applications. 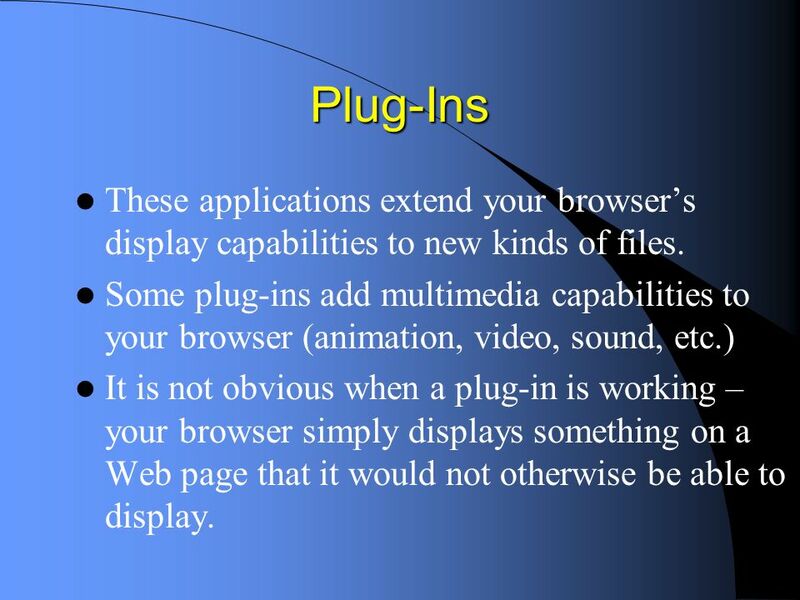 4 Plug-Ins These applications extend your browsers display capabilities to new kinds of files. Some plug-ins add multimedia capabilities to your browser (animation, video, sound, etc.) It is not obvious when a plug-in is working – your browser simply displays something on a Web page that it would not otherwise be able to display. 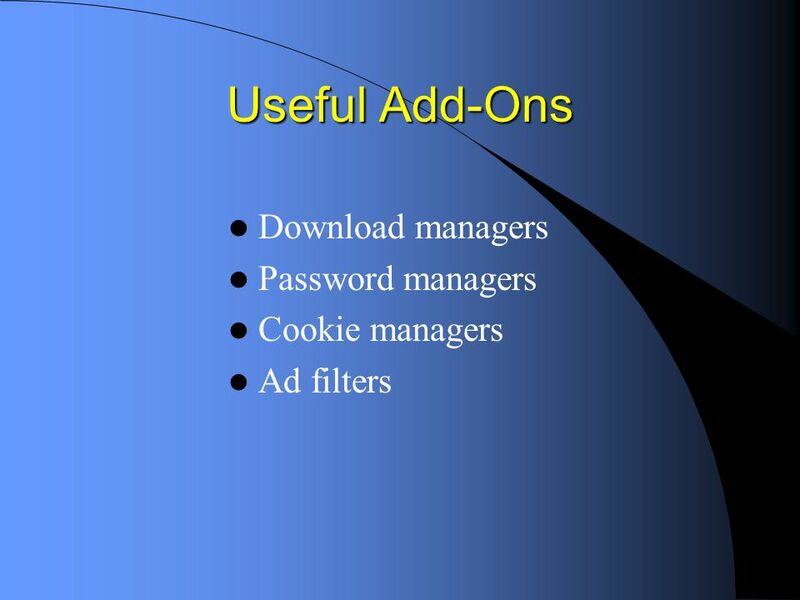 5 Add-Ons A browser add-on is an application that is launched from your browser – either automatically (e.g. a download manager) or when you explicity ask for it (e.g. a meta search engine). 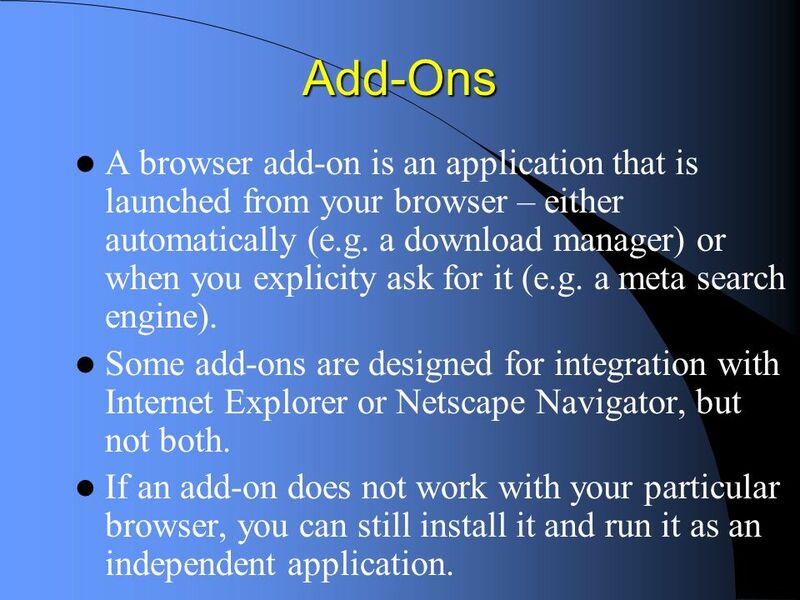 Some add-ons are designed for integration with Internet Explorer or Netscape Navigator, but not both. If an add-on does not work with your particular browser, you can still install it and run it as an independent application. 6 Helper Applications When a browser encounters a file that requires a special application, it can automatically launch an stand-alone application (e.g. a.doc file could launch Microsoft Word). 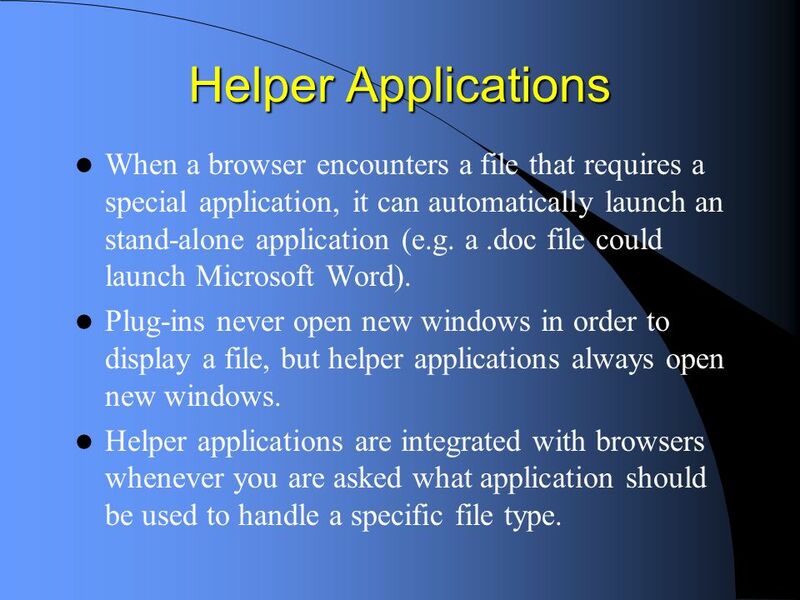 Plug-ins never open new windows in order to display a file, but helper applications always open new windows. Helper applications are integrated with browsers whenever you are asked what application should be used to handle a specific file type. 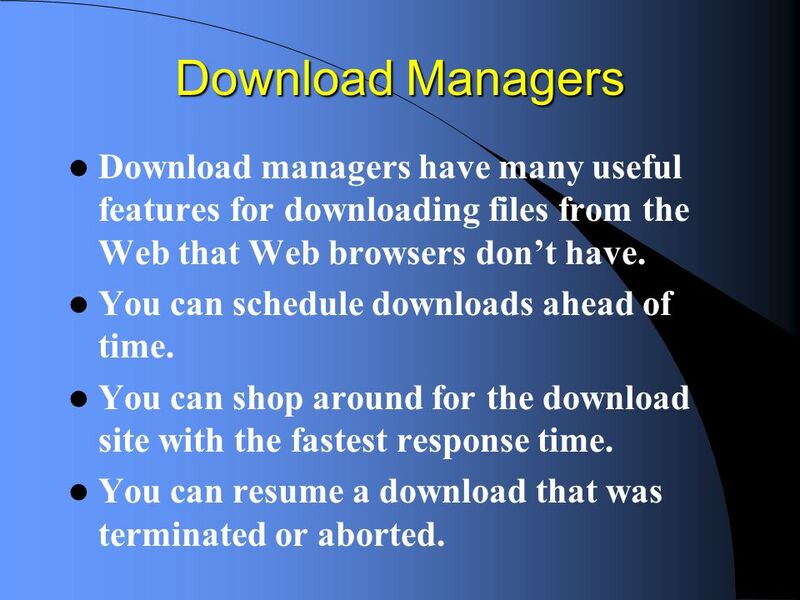 8 Download Managers Download managers have many useful features for downloading files from the Web that Web browsers dont have. You can schedule downloads ahead of time. You can shop around for the download site with the fastest response time. You can resume a download that was terminated or aborted. 9 Password Managers Many Web sites require user sign-ins. Its hard to remember dozens of userids and passwords, but its not smart to use the same userid and password at lots of different Web sites. 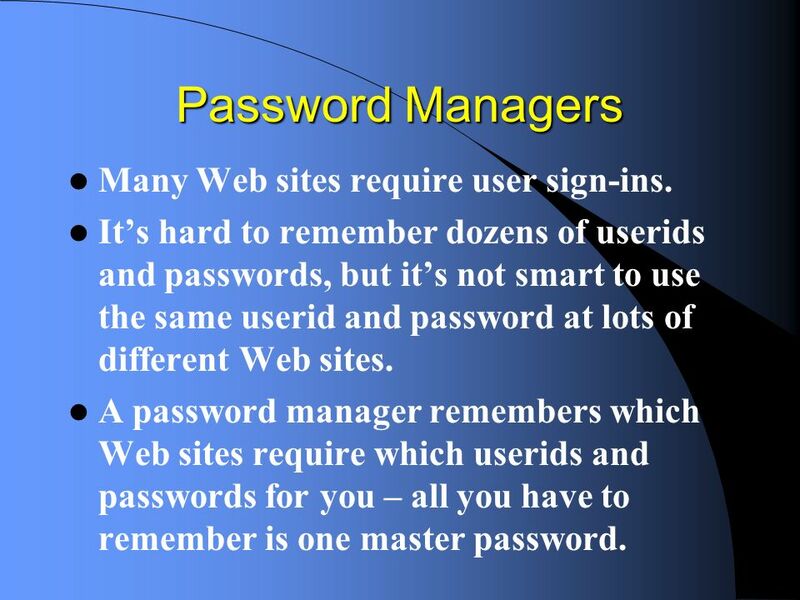 A password manager remembers which Web sites require which userids and passwords for you – all you have to remember is one master password. 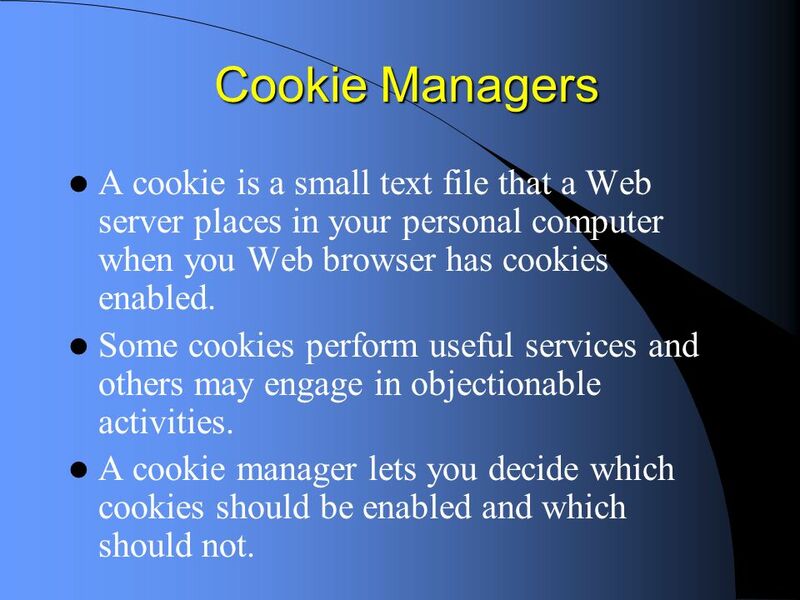 10 Cookie Managers A cookie is a small text file that a Web server places in your personal computer when you Web browser has cookies enabled. Some cookies perform useful services and others may engage in objectionable activities. A cookie manager lets you decide which cookies should be enabled and which should not. 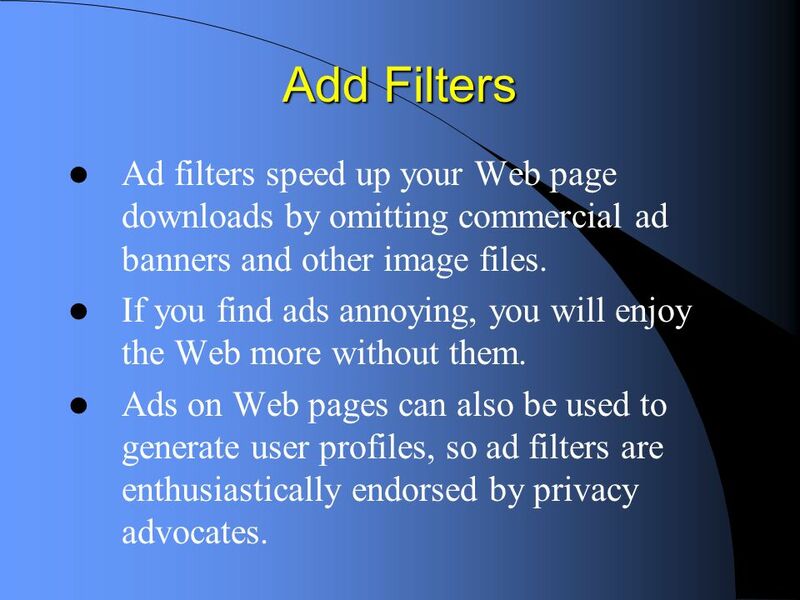 11 Add Filters Ad filters speed up your Web page downloads by omitting commercial ad banners and other image files. If you find ads annoying, you will enjoy the Web more without them. Ads on Web pages can also be used to generate user profiles, so ad filters are enthusiastically endorsed by privacy advocates. Download ppt "The Web Wizards Guide to Freeware/Shareware Chapter Three Customizing Your Online Experience." The Web Wizards Guide to Freeware/Shareware Chapter Two Downloading and Installing Software. The Web Wizards Guide to HTML Chapter One World Wide Web Basics. The Web Wizards Guide to Freeware/Shareware Chapter Four Essential Tools for Web Page Authors. Copyright © 2003 Pearson Education, Inc. Slide 9-1. The Web Wizards Guide to HTML Chapter Eight Publishing on the Web. By the end of this section, you will know and understand the hardware and software involved in making a LAN! Google Chrome & Search C Chapter 18. Objectives 1.Use Google Chrome to navigate the Word Wide Web. 2.Manage bookmarks for web pages. 3.Perform basic keyword. Web browsers It’s a software application for retrieving and presenting information on WWW. An information resource is identified by a Uniform Resource. Section 9.1 Identify multimedia design guidelines Identify sources of multimedia files Explain the ethical use of multimedia files Describe multimedia. 6/10/2015Cookies1 What are Cookies? 6/10/2015Cookies2 How did they do that? Chapter 9: Configuring Internet Explorer. Internet Explorer Usability Features Reorganized user interface Instant Search box RSS support Tabbed browsing. Power Point Demonstration Capabilities of Microsoft Power Point 2000. Web Security A how to guide on Keeping your Website Safe. By: Robert Black. Extras Plus! Pepper. Objectives extra knowledge Cookies Picture handling when creating site. PowerPoint Demonstration Capabilities of Microsoft PowerPoint 2000. Windows Security Tech Talk 9/25/07. What is a virus?  A computer program designed to self replicate without permission from the end user  The program.